Enjoy a 14 day adventure with the ease of starting and ending your journey in the lively city of Montreal. Explore lighthouses and relax on your whale watching cruise from Tadoussac. Accommodation in clean and comfortable hotels with private facilities, meals as indicated (B=breakfast, L=lunch, D=dinner), car hire, return ferry Riviere du Loup/Pot a l’Eau de Vie Island (Lighthouse), boat ride to Bonaventure Island and Rock Perce ex Perce, catamaran crossing from Rimouski to Forestville and Whale watching cruise ex Tadoussac. Experience the old world charm of Vieux Quebec with its cobblestone streets, fortified city wall (one of a kind in North America), and seventeenth century architecture. This UNESCO World Heritage Site is complimented by artisan shops, Parisian cafes, landscaped parks and numerous monuments. 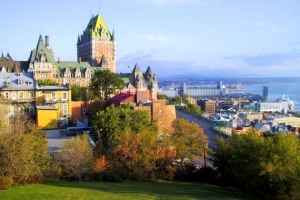 Take a stroll on the Plains of Abraham and visit the historic Chateau Frontenac. Today enjoy a 3-hour whale watching cruise (included). Five or six species, including the humpback whale (15m), the fin whale (20m), and the blue whale—the world’s largest mammal (30m), come inland as far as the Charlevoix coastal area for feeding. Catch the 10 minute free ferry ride across to Baie Ste Catherine and proceed to la Malbaie where you will spend the night. Prices based on twin share accommodation, please contact us for single pricing. We are happy to help plan and to make recommendations for further adventures in Alaska & Canada. contact us to begin planning your trip today!